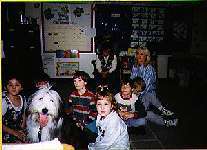 Hobo visited with Ms DeRuiter's Class in February 1997. 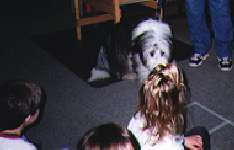 The class was studying the letter "T" so Hobo demonstrated his Tricks and recieved Treats. The class later made a book called "All about Hobo" First you will see pictures and then some of the kids comments. Comments by the class as found in "All about Hobo"
Jeremy - Hobo is Scott's dog. Ginger is my pet. Hobo counted four. Hobo barked four times. Kyle - Hobo had treats and did tricks. 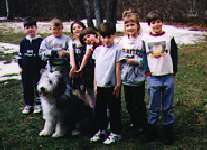 I think Hobo was a good dog. Hobo can count. He counted to four. 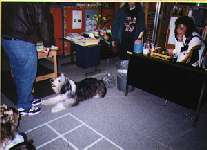 Sarah - He made dog tricks. Hobo was laying down. Jerimiah - He gets treats. Jessica - Hobo is a dog.